The National Weather Service said at least five different tornadoes touched down in East Texas on Wednesday. A team from the National Weather Service surveyed the damage in Van Zandt, Henderson and Hopkins counties. One twister left a 15-mile trail of destruction near Canton. The vortex stripped the roof and some of the walls from one home, destroyed a rural church, toppled and uprooted trees and damaged sheds, barns and outbuildings from northwest Canton to near Silver Lake. A National Weather Service statement Thursday estimated the tornado packed winds of 110-120 mph. On Thursday, Van Zandt County Emergency Management Coordinator Chuck Allen said one person was injured and more than 440 acres, including about 30 homes, were devastated by Wednesday's storm. 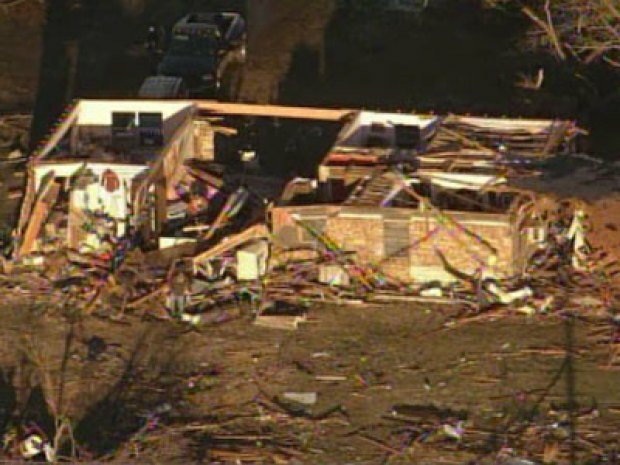 Chopper 5 flies over homes damaged in Wednesday afternoon's storms. "The lady that was injured, my understanding was, she was sucked out of the residence and hit a tree ... she sustained a head injury," said Allen. The woman was treated and released from an area hospital. "It's pretty devastating," said Allen. "We've had several tornadoes, y'all are well aware, that have come through our county in the past four or five years, but by far, this is the most devastating storm that's come through here in years. We have multiple homes up there off [FM] 1255 that are just gone." South of Canton, at least two tornadoes snaked across part of eastern Henderson County. 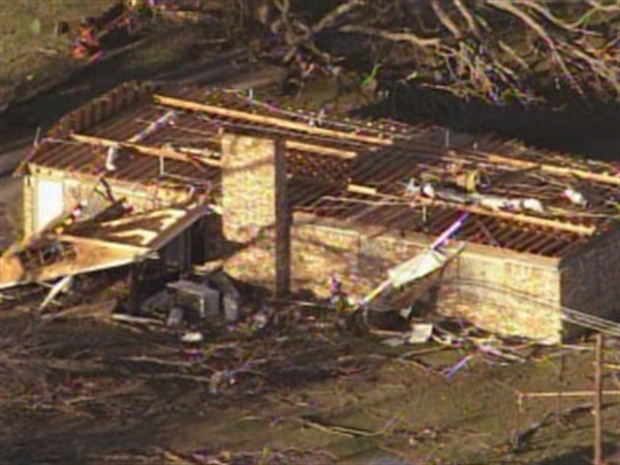 The first near the town of Larue, about 10 miles southeast of Athens and 80 miles southeast of Dallas, collapsed some structure walls with winds estimated at up to 130 mph. Another tracked from near Poynor northeast toward Coffee City, near Lake Palestine, dislodging a mobile home and damaging a wood-framed home along a three-mile damage path. The weather service estimated its winds at 90-100 mph. Another weather service statement Thursday said at least two twister tore across parts of Hopkins County in northeast Texas. One tracked 1½ miles from four miles southwest of Sulpher Springs to the northeast. It destroyed one mobile home, injuring two occupants and damaging a metal shed. The weather service estimated its speeds at near 80 mph. Another twister touched down about a mile south of downtown Sulphur Springs and tore northeast for 1½ miles, damaging about 50 homes and impaling one with large tree branches. Its winds were estimated at about 80-85 mph. National Weather Service investigators surveyed the damage from Thursday's storms and interviewed residents to determine three twistered touched down in East Texas. Just before 5 p.m. Wednesday, a tornado warning was issued west of Canton, with the storm moving in an easterly direction. Just 12 minutes later, there appeared to be the first touch down of a tornado west of the sheriff's office. Debra Bennett's 30-acre property in Canton was smashed to pieces in 30 seconds. "Well, it looks like a war zone," she said. 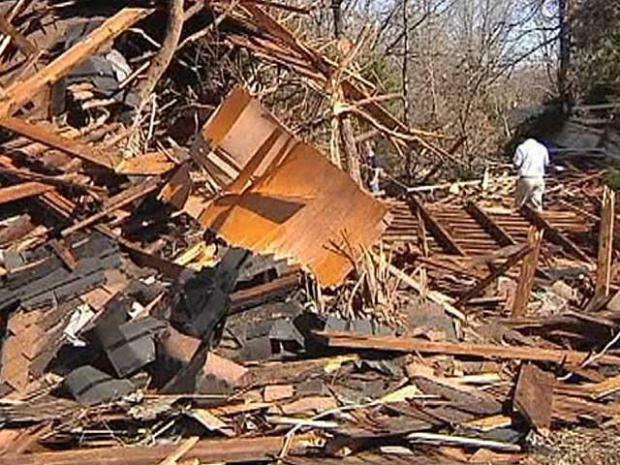 Several tornadoes touch down in East Texas leaving a path of destruction behind. She and her family just made it inside the house. And her recently renovated home was the only one in the area to stand the test of wind. "All the beating and the banging and glass breaking -- it just seemed like it took forever," Bennett said. 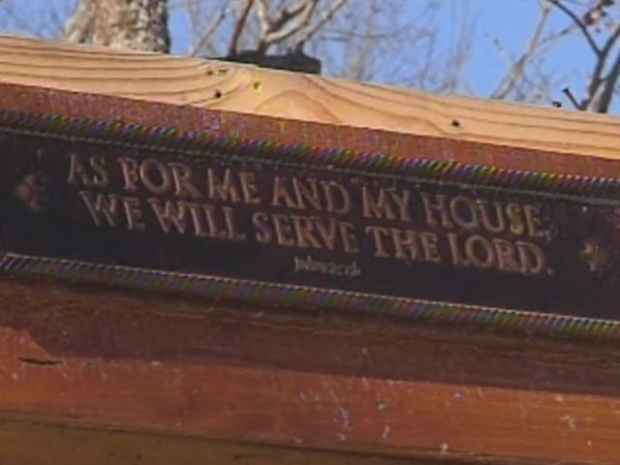 In one case, a church was completely leveled, Allen said. Adding to the misery, Allen said a lot of the homeowners in the area had stopped carrying homeowners insurance while trying to make ends meet in a tough economy. Many families began cleaning up early Thursday. "This is probably one of the more significant January tornado outbreaks in Texas history," said Bill Bunting, meteorologist with the National Weather Service in Fort Worth. The Red Cross is assisting those affected by the storm. Afternoon thunderstorms rattled parts of North Texas Wednesday afternoon, with some of the storms turning severe. The National Weather Service issued severe thunderstorm warnings for several North Texas counties, and a tornado warning was issued for Van Zandt County. Hail ranging in size from pea-sized to golf-ball-sized was reported in Forney and in parts east including Grand Saline in Van Zandt County. The most damaging winds hit about four miles outside of Canton. The possible tornado ripped off roofs, toppled 18-wheelers and knocked down power lines. "I was eating a hamburger at McDonald's when it happened; all of a sudden, (I hear) screaming, 'Get in the walk-in, get in the walk-in.' I thought he was just kidding," truck driver Jolliff Richard said. "The clouds were coming right at us. They were crossing; they were going all directions," roadside vendor Gary Mitchell said. "It made no sense, and I knew we were in trouble." The roadside market he and other vendors operated near the intersection of Interstate 20 and state Highway 19 was destroyed. "Total annihilation -- we took a direct hit," Mitchell said. "We are very lucky to be alive." Chopper video showed damage at two Shell and Chevron stations on I-20 at Highway 19. Part of the roof collapsed at the Chevron station. Video also showed a truck on its side in front of the Dairy Queen next door to the Chevron. "The wind just hit in an extremely swirly motion. Metal was flying everywhere, and I felt like Dorothy on 'The Wizard of Oz,'" said Tim Ellis, the owner of the Chevron. He was outside his station when the suspected tornado hit. He said he was grateful to have survived. "I feel blessed. This wasn't my time," he said. Chuck Allen, of the Van Zandt County Sheriff's Department, said deputies reported seeing a funnel cloud lowering from the clouds two miles west of Canton. Allen said parts of I-20 were closed before Canton because of power lines down on the road. Chopper video showed a long backup of vehicles on I-20. The interstate was closed for several hours. Van Zandt County dispatchers said there was damage on Farm to Market Road 859 in Canton. The Grand Saline Fire Department reported damage east of the city and possibly one person trapped in an overturned trailer. Hopkins County sheriff's Deputy Ron Lowrie said the wind damaged three mobile homes and toppled two tractor-trailer rigs, closing Interstate 30 for a while near Sulphur Springs. He said no injuries were reported. The American Red Cross said Wednesday that about 50 homes sustained at least some damage in Van Zandt and Hopkins counties. The Red Cross opened a shelter at the Van Zandt County Fairgrounds at state Highway 64 and state Highway 243. Randy McIlwain contributed to this report.